When it comes to interior decor, you can easily distinguish Scandinavian designs. The beauty of Nordic style lies in the minimalist use of ornamental elements and emphasis on functionality. Nature inspired designs, sleek curves, smooth finishes and brilliant use of colors are the characteristics that mark this style. If you are planning to renovate your dining room, check out these Scandinavian style dining table design ideas. To add an element of interest to the basic design, you can mix and match different colored chairs. A combination of yellow and white chairs placed randomly around an oval shaped dining table captures both simplicity and style. A pure white dining table paired with brown colored chairs creates an elegant look. The color White, which is predominantly used in Scandinavian designs, adds an element of excitement to the dining room. 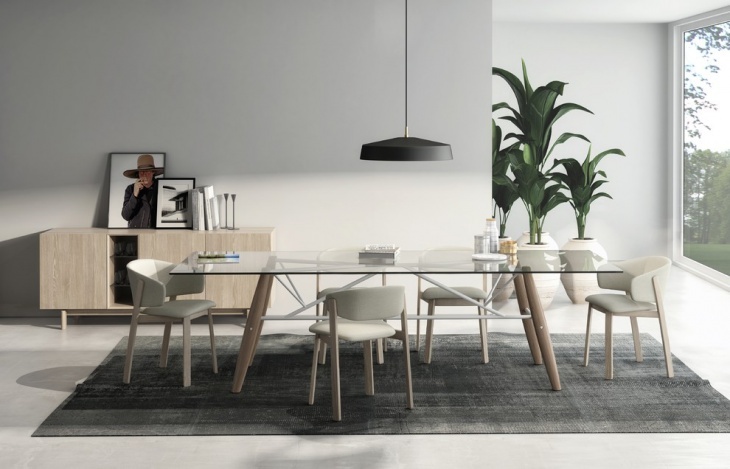 For a modern dining room, you can choose to go with a Monza table and chic Adelaide chairs. The sleek curves of the Adelaide and the polished glass tabletop beautifully complement the interiors. This design is best suitable for homes with spacious dining halls. Play with light shades of gray and pink colors to create a unique style for your kitchen. Placing a pale pink sofa against the gray wall, adds warmth and texture to the room. 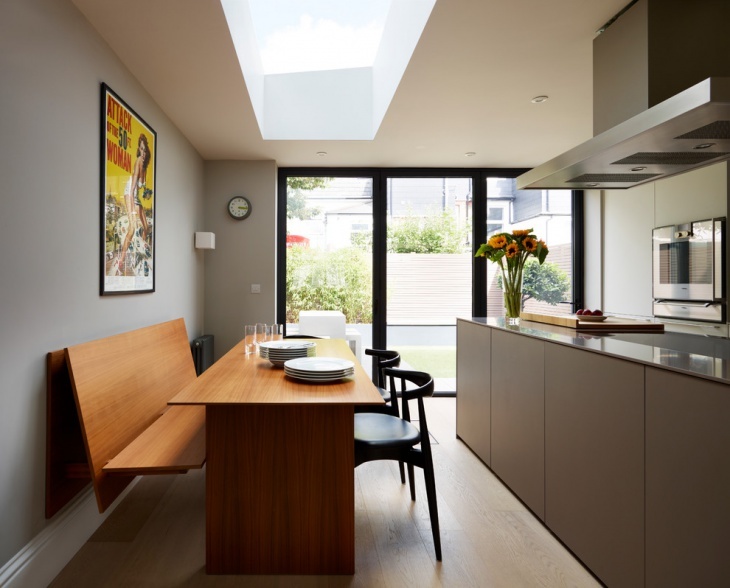 The painting in the backdrop, the white windows, and the overhanging lighting fixture altogether complement the dark colored wooden dining table perfectly. A black wood dining table is a great way of transforming your kitchen into a classy and sophisticated space. 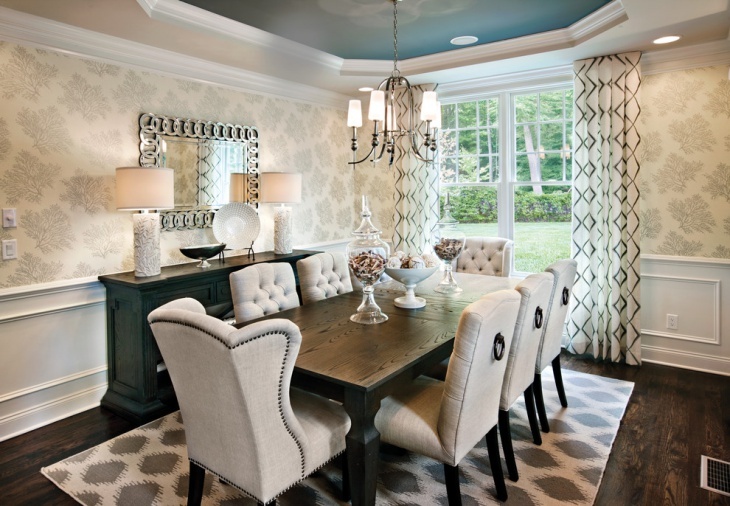 The dark table and the light colored chairs alone manage to create a stunning look. You can add a quirky piece of a chandelier to complete the look. To break the monotony, you can go for a slightly irregular shaped wooden dining table in a dark color. Black metal chairs and fuss-free candle holders hanging overhead renders a rustic feel to your dining room. 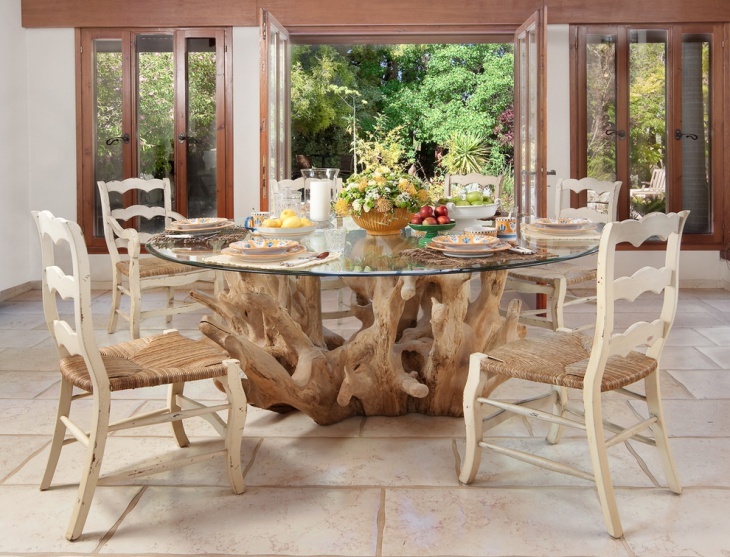 You can go old school by choosing a simple dining table, which is void of any adornments. Team it with cushioned chairs for a traditional kitchen. 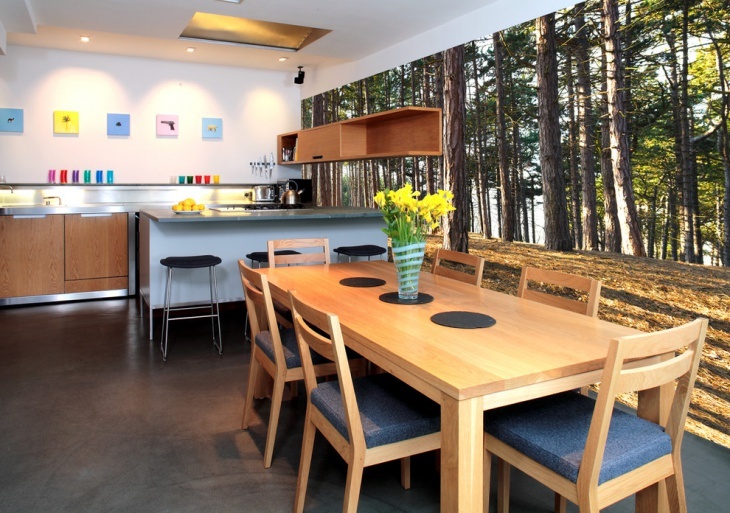 The most striking element of this dining area is the use of a wallpaper showing woods as a lively backdrop. If you have a spacious kitchen, then you can turn it into a mid-century dining room, where you can host family get-togethers and lavish dinners. What you need to consider while decorating your kitchen is how to turn it into an entertainment hub. 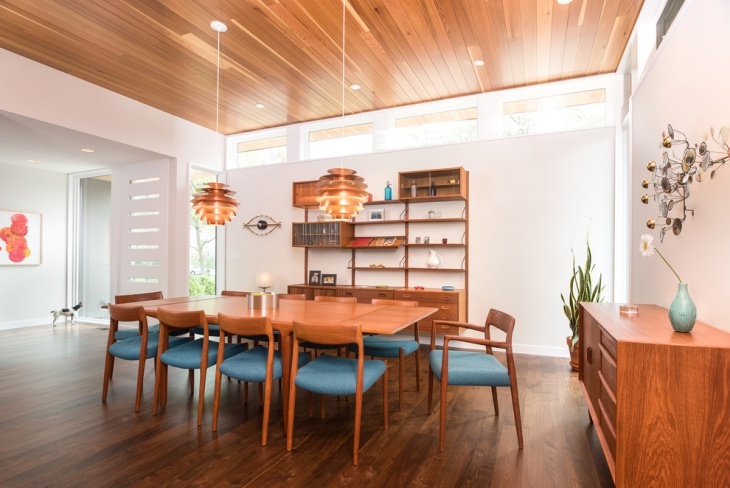 Here the color of the Danish furnishing, the lighting fixture, and the cedar ceiling are all perfectly matched. You don’t always have to use chairs to go with your dining table. You can match it with a bench and turn it into a lovely dining space. Here you can find a kaolin and clay laminate bench fixed to the wall, matched with metal chairs. 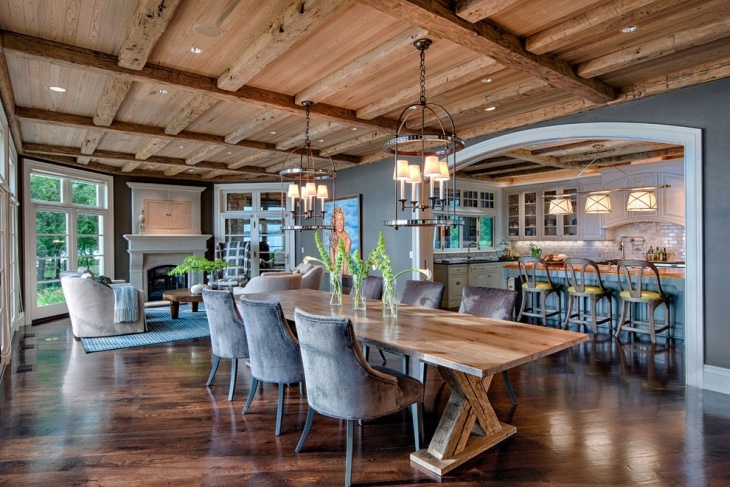 This dining space feels warm and inviting to the visitors. 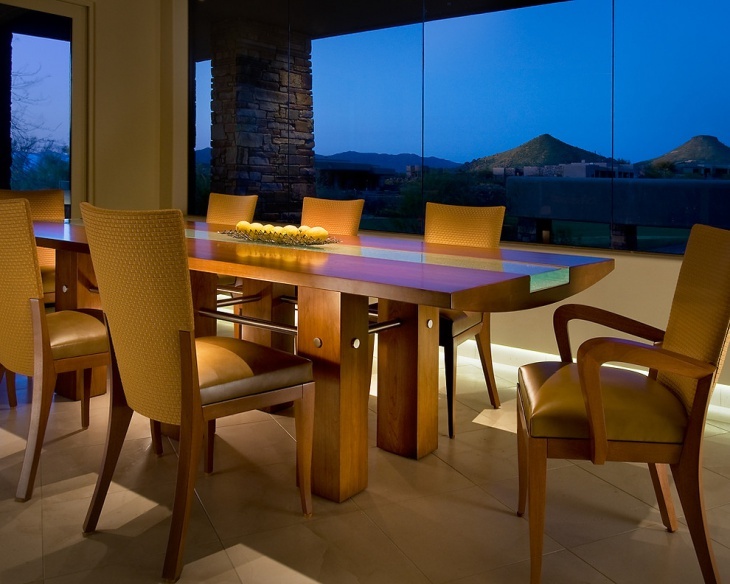 A glass top dining table is an excellent way of transforming your kitchen into a vivid, yet elegant dining space. The impressive look lies in its pure simplicity. The steel beams designed to support the tempered glass top also help in emphasizing the overall look. When you are designing your kitchen, remember to keep it simple and use basic elements. You need to focus on functionality and highlight it in a subtle way. 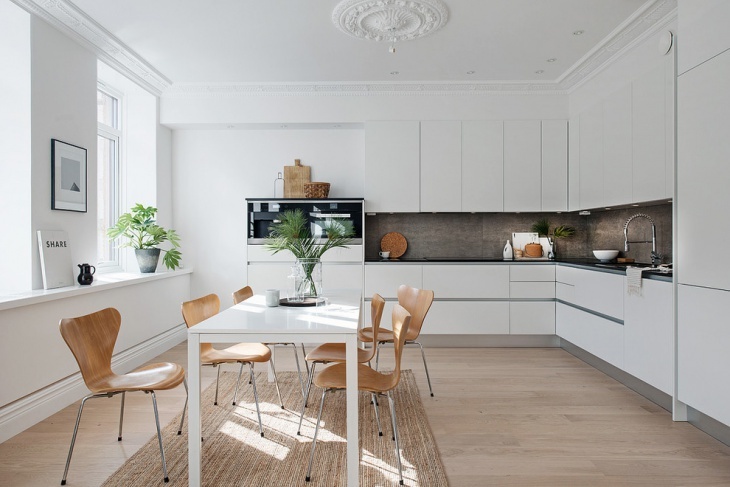 Hope the above dining room design ideas will inspire you to decorate your kitchen in Scandinavian style.